Video opens with a red television-like border and “art asl video” above two white triangles representing the letter A and V with an one-eyed hand in the middle. Below reads “awards 2019”. (TV SNOW) Header is followed by a video of two young people at a park. The female taps the male and tells him she has an idea. The male asks what the idea is. She suggests that they make a short video. He agrees and says sure. She with a big smile grabs her smartphone out of her pocket. We get a sneak peek of them recording each other signing in ASL. Signs for “CHAMP” and “BEAUTIFUL” are seen. They regroup to review their work. You can see their work done in black and white on her phone. Clip transits with TV “snow” and then the red tv-like border again with words in black and white explaining that you have until May 15, 2019 to submit your artwork to www.artaslvideo.com. (TV SNOW) The screening and awards will take place during the biannual ASLTA Conference at the Grand Manchester Hyatt on July 1, 2019. See www.aslta2019.com for more information. (TV SNOW) AAVA is sponsored and made possible by ASLTA So-Cal, Eyeth Entertainment, and CAD. AAVA is produced by Lenois Productions. (TV SNOW) The video ends with the AAVA red hand winking at you. “Routine” was produced by Jon Savage. The 12-minute film about two strange people who observe each other at the same time and place everyday. Until one of them is willing to step up. 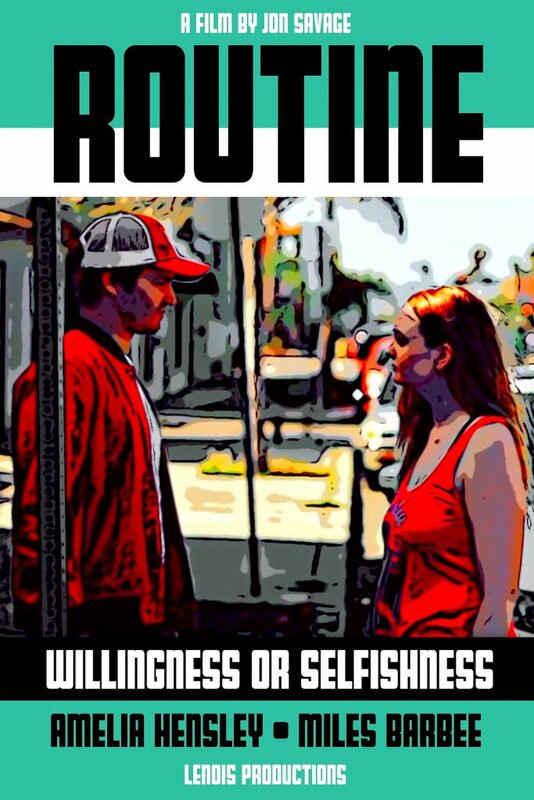 “Routine” is available to watch at a film festival at this year. Keep an eye out because it may be screened in your area! Transcript: Do you enjoy creating art? Do you love ASL? Do you like to make your own videos? Well, if you put them all together, you’ve got art ASL videos! We have a fun competition for you: ART ASL VIDEO AWARDS! CD: In an old TV-like set up, Erin in black shirt and standing. The end image has thin black words on a light blue background that reads ” For more info about video art call for entries at www.artaslvideo.com” and then a Lenois Production logo on the bottom. Lily: I’m so excited that LP has decided to start AAVA! Erin: Me too! Why did you decide to start AAVA? Jon: Of course! I love seeing art and ASL incorporated into the community. Holly: Yes! I love seeing social events that involve, engage, and bring together the community! Erin and Lily: That’s Deaf community!